Last year I wrote a small essay on failure based on Will Smith’s Instagram stories. You can read it here. I described failure as “the least immediately beneficial outcome from trying to be successful”. And if you remove the negative emotions from failing, that’s all it really is. By treating failure as a learning experience, you’re zeroing in on what it takes to be successful. Which is the opposite of a bad thing. Indeed, accepting that failure’s vital to success can make the difference between good Recruiters and great ones. And here are five TED Talks that back me up. Fail to watch them at your peril. Dr. Raphael Rose is a Clinical Psychologist specialising in resilience to stress, anxiety and depression. He’s worked on studies funded by NASA for over a decade as AD of the Anxiety and Depression Research Center at UCLA. He begins this talk with a quick thought exercise involving the Arctic’s resident apex predator. To highlight the fact that suppressing stressors is not an effective strategy for coping with failure. You’ve got to face challenges head on. Start small and go from there. KPIs break down large objectives into more manageable tasks. And crossing them off your to do list should reduce stressing about failure in a gradual way. But better than doing that’s to embark on tasks which hold more meaning to you. That could be building your brand, writing an article about your market or talking to a prospective new client about anything other than business. Because if your activities are more meaningful, it takes the stress out of failure. Which is what’s supposed to build your resilience to it. Alison Ledgerwood’s a Professor in the Department of Psychology at UC Davis. She’s a social psychologist. Or in her own words “a professional people watcher”. She’s observed that most people’s baseline mood is relatively neutral. Then something good happens and they gain a rush of positivity. It might be pulling a meaty job with a new client, an offer coming through from an old favourite, or a contractor renewing for another long assignment. Everything’s gravy. Then a couple of hours pass and you revert back to neutral. But when your Manager’s been on your case, none of your good candidates are calling you back, and you started the week with a client meeting that could only be described as an unmitigated disaster, it’s infinitely easier to lose positivity and drop into a negative mindset. The answer could be to do with how the situation’s framed. Although it’s measurably harder to reframe bad situations to good than it is the other way round, our minds need regular practice to focus on the positive. Especially in the face of failure. Jia Jiang’s an entrepreneur who’s delivered this TED Talk solely for the benefit of any Consultant currently demoralised by BD. He tells us about a childhood experience of rejection. As well as the superhuman resilience you feel overcoming a perceived failure. Jia began testing this by putting himself in situations where he was likely to be rejected. Asking a stranger for a hundred dollars, trying to get a “burger refill” at Five Guys, his antics went semi-viral on YouTube and spun out into a huge series. By his own admission, it showed how scared of rejection Jia appeared in the videos, and by contrast how nonplussed his subjects were. And sometimes, people even said yes. He also switches positives and negatives in order to reframe failure: a ‘failure’ would be getting what he wants, while success is continually being rejected. In terms of BD, it means every failure is largely inconsequential. And every success is potentially 3 or 4 years worth of placeable jobs with a new client. The point is you have to do the leg work. When Kathryn Schulz isn’t publishing books or writing pieces for The New Yorker, she’s a wrongologist. Feeling right feels good. Not just making the right judgements but having faith in our place in the world. Being wrong is nothing compared to realising you’re wrong. Being wrong’s easy to admit to and easy to fix. A breeze. But being wrong’s also extremely easy to believe. We move through some fairly mind expanding musings on what it’s like being wrong over the course of this talk. Which takes it further away from recruitment specifically and more about broader life stuff. Do you think you’re never wrong? If you only have time to watch one of these, make it this one. The spectacularly named Astro Teller’s in charge of projects at the Google X labs. And like their thus far ill-fated Glass project, he’s no stranger to failure. Astro talks us through the projects Google X killed in what’s obviously a relatively elaborate sales pitch for Google. But there’s some good, common truths behind what he’s saying. We’re told how their dev team actively seek out failure from the design stage onwards. Because it makes good ideas less vulnerable to failure as they develop, thus ensuring the best ideas get as close to being real as possible. Apply the same level of attention to auditing your candidate pipelines, marketing strategies, and advertisements. Because you can’t consider yourself immune to failure if you’ve not experienced it firsthand and returned stronger from it. A common theme is that failure is unavoidable. It’s the byproduct of doing anything. So it’s best to be comfortable with it. But if you can approach failure in a way that ignores the negative consequences of failing, you open yourself up to ways of succeeding that are both realistic and longer lasting than you might be used to. If all the motivational self-help books about leadership on my shelf are to be believed, one of the only genuinely bad ways to fail is by failing to act. And if you act without careful decision, you’ll fail more than most. And not in a good way. 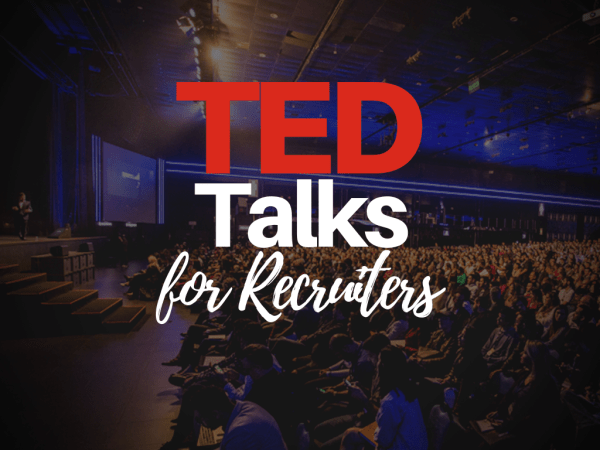 Up for more TED Talks? The most recent entry in this series is all about making tough decisions. And you can queue it up for your lunch break, here.